OSWEGO, NY – In keeping with their tradition of giving back to the community, members of BPO Elks Lodge #271 recently presented United Way of Greater Oswego with a $5,000 donation in support of United Way’s Community Fund. Members of BPO Elks #271 in Oswego present Lois Luber, resource development director with United Way of Oswego County with a check for $5,000 for the United Way’s Community Fund. 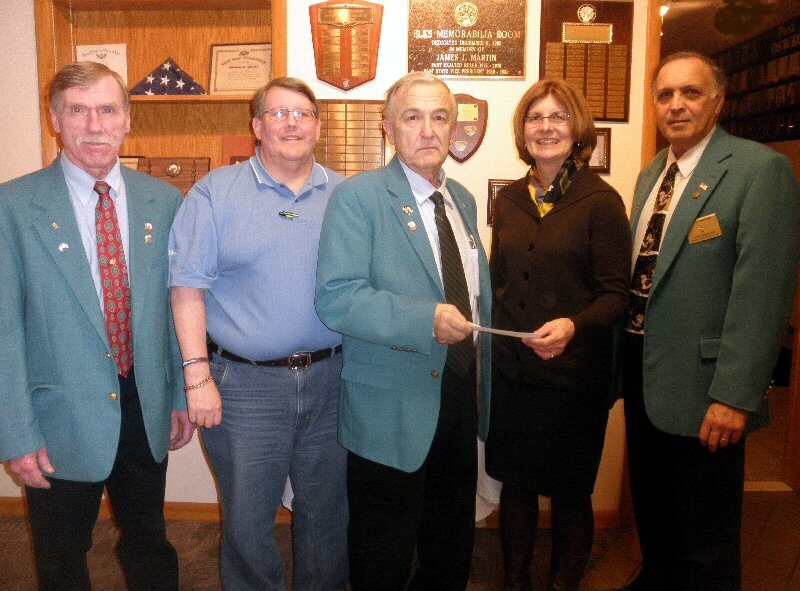 From left are: Tom Wuilliez, AJ Combs, Exalted Ruler, John Pelmear, Lois Luber, and John Rinaldo. Oswego Elks member Tom Wuilliez said that the membership was happy to be able to help United Way in its efforts to improve the quality of life in Oswego and its neighboring communities. “The United Way does a remarkable job helping those in need. The many programs supported by United Way, and administered through United Way member agencies, have a positive effect on those that they serve. From youth to seniors United Way programs make a difference. It is our community and we do take it personal. We are appreciative of what United Way does and are happy to be able to count them among the organizations that the Oswego Elks Lodge #271 supports,” said Wuilliez. According to Melanie Trexler, executive director of the United Way of Greater Oswego County, the agency’s Community Fund serves a wide variety of human services program. “The Community Fund allows us to providing funding to those programs when they need it the most. The Community Fund is an essential part of our annual campaign and we are thankful that the Oswego Elks Lodge recognizes our efforts and chose us for this generous donation. It is a wonderful example of how the partnerships we create with our area organizations allow us to serve even more families and individuals in Oswego County,” said Trexler. For more information on United Way of Greater Oswego County, or to contribute to its annual campaign, call 315-593-1900.